In August 1989, the Topps Company opened its "vault" to auction off unique items like the original cartoons drawn for the 1971-72 series of hockey cards. I was lucky enough to get the cartoon for Meehan's card. 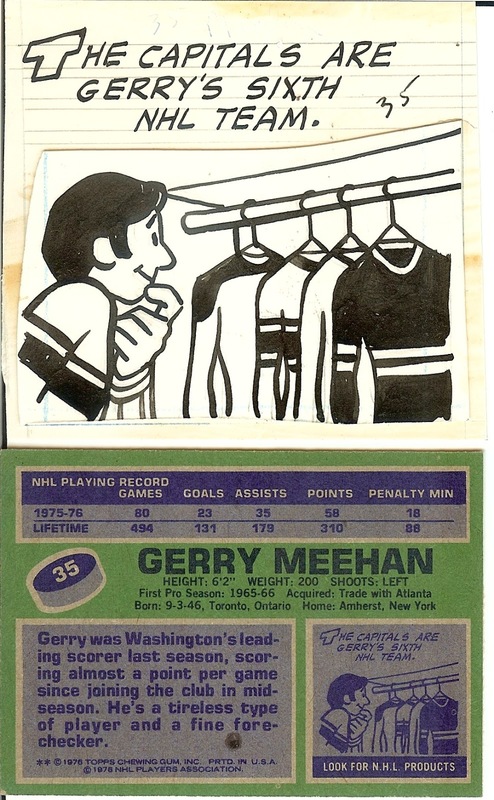 And this is the original cartoon for the Topps 1976-77 card. 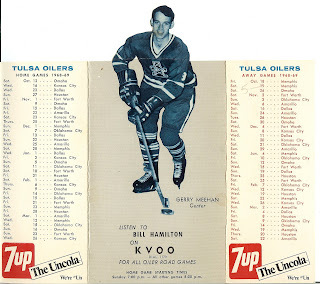 I just found this 40-year-old schedule, printed on heavy paper stock -- the oldest item in my collection, featuring Meehan as a Tulsa Oiler. During the 1997-98 season, the Toronto St. Michael's Majors (of the Ontario Hockey League) honored alums on their tickets. 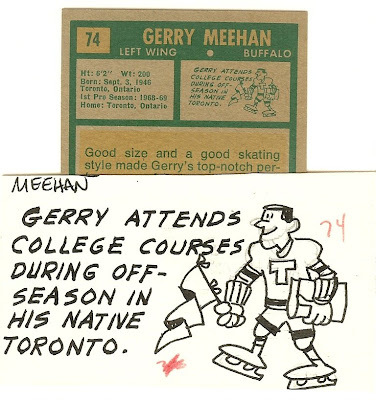 Meehan was featured on the ticket for a game against Oshawa on Dec. 4, 1997 at St. Michael's Arena. 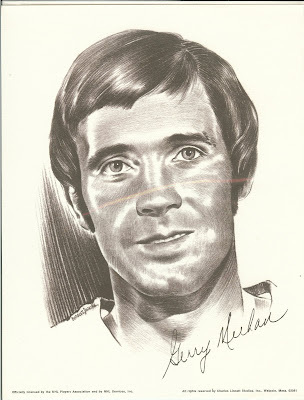 After the 1961-62 season, St. Michael's College discontinued its hockey program, and the Toronto St. Michael's Majors team transferred to Neil McNeil High School, becoming the Toronto Neil McNeil Maroons. 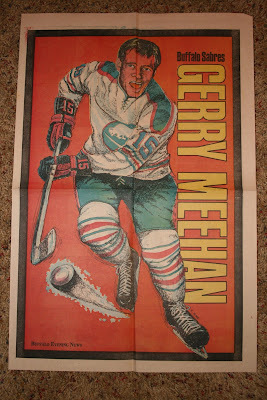 In 1962-63, Meehan helped the team finish first in the Metro Junior A league. The 1997-98 season marked the team's return to junior hockey after more than 35 years. 8.5 x 11 sketch by Charles Linnett, 1973. Text reads "Officially licensed by the NHL Players Association and by NHL Services, Inc. All rights reserved by Charles Linnett Studios, Inc., Walpole, Mass. 02081." This is the photo the sketch was based on, with a handwritten misspelling of "Gerry." This full-page foldout poster was an insert in the Buffalo Evening News on Jan. 13, 1973. 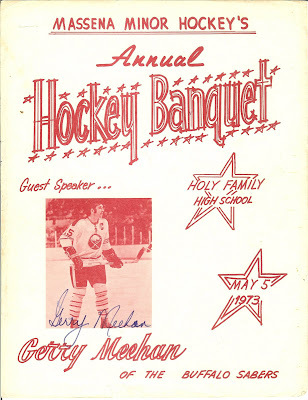 On May 5, 1973, Gerry Meehan was the guest speaker at a hockey banquet for the Massena Minor Hockey league, held at Holy Family High School. Someone who attended got his autograph and years later contributed it to my collection. Massena is a tiny town in upstate New York, along the St. Lawrence River, and despite a population of less than 12,000, Massena Minor Hockey and Massena Red Raider High School Hockey have produced several state championship teams. During the 1971-72 season, the Toronto Sun included inserts of NHL players -- 5x7 pages with two holes punched, I guess so you could keep them in a binder. Bio information is on the back. These are very fragile, since they are on newspaper stock. 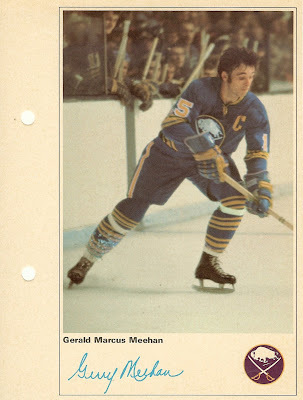 In 1984, Meehan became the first former Buffalo Sabre to take a front-office position with the team. 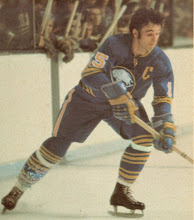 He served as assistant general manager under coach and general manager Scotty Bowman. 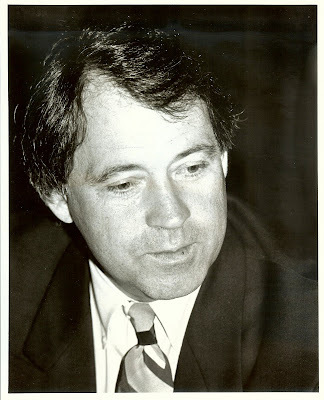 During the 1986–87 season, Bowman stepped down, and Meehan was promoted to general manager. In 1993, Meehan was named executive vice president of sports operations, and he resigned in December 1994. 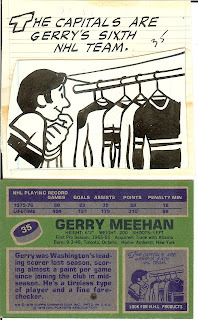 Rich Sander sent me this cool photo of Gerry Meehan and a young fan. He writes: "It was taken on my cell phone at the 40th anniversary celebration of the Sabres last year. They had a great exhibit at the Albright-Knox Art Gallery (in Buffalo)." This is a classic photo that I had never seen. Thanks, Rich! Can anyone help me identify the original photographer? It looks like "David Schofig..."
A rare addition to the Gerry Meehan Archives, this is an original, authentic photo from the Sporting News Collection. 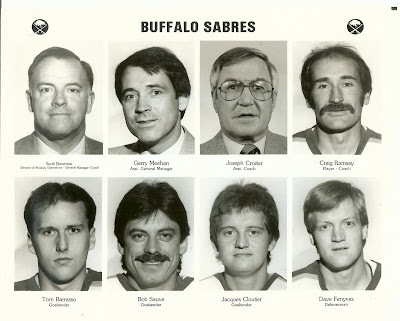 It was taken in 1993 when Meehan was general manager of the Sabres, by Bruce Bennett. The John Rogers Photo Archive is the largest privately owned collection of photographic images (more than 33 million). For more information, visit the Rogers Photo Archive. 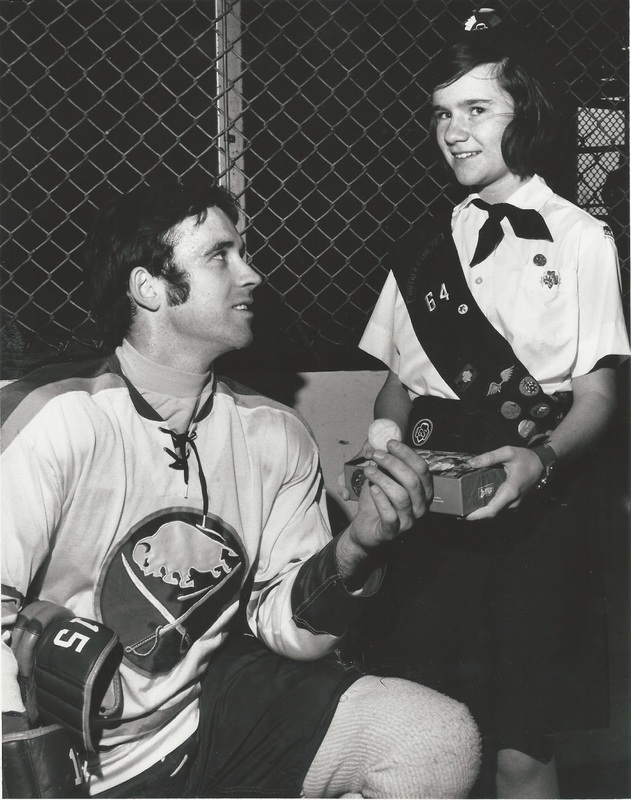 In 1972, Gerry Meehan represented the Buffalo Sabres to kick off the annual Girl Scout cookie sale. In this original photo, Meehan appears with 12-year-old Girl Scout Ellen T. Carney, daughter of Mrs and Mrs. Bernard W. Carney of Buffalo.